Originally uploaded by Conglomerate: Gordon. 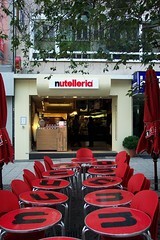 Last summer, I posted some photos from my trip to the Nutelleria in Frankfurt. I discovered recently that the photo links had been lost in our conversion to Typepad. Although I have been using Flickr for various purposes for months, I finally decided to upload some of my own photos, namely, the photos whose links had been lost in the conversion. For the moment, I have a free account on Flickr, but it probably won't be long before we go Pro.